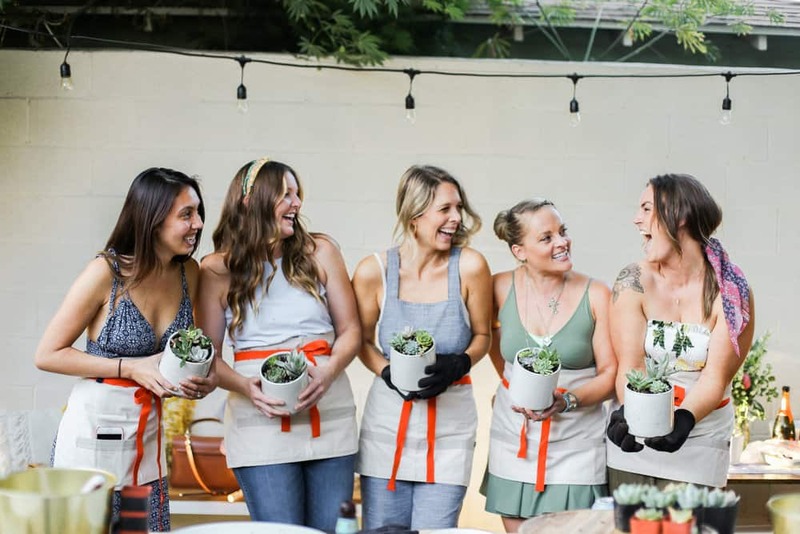 If you love sprinkling succulents around your house as much as my friends and I do then you are going to LOVE this succulent and spritzer garden party! 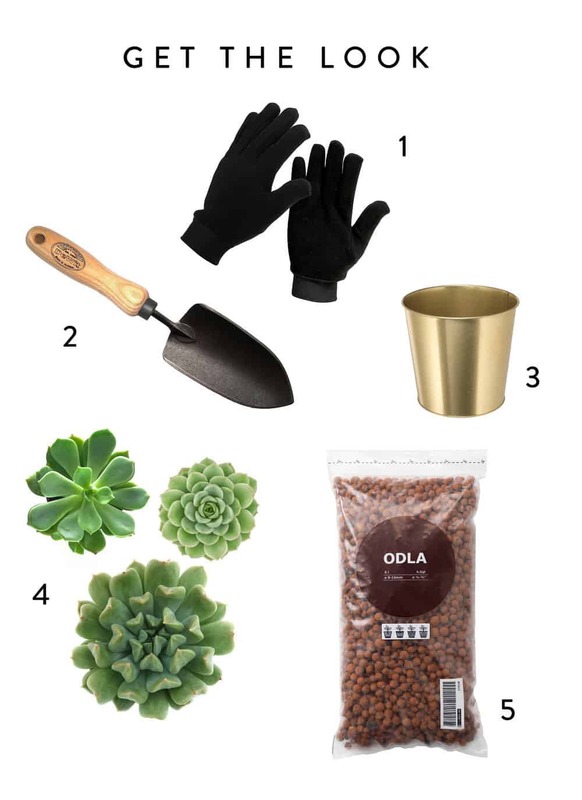 We created a diy planting station with inexpensive supplies right in my backyard. 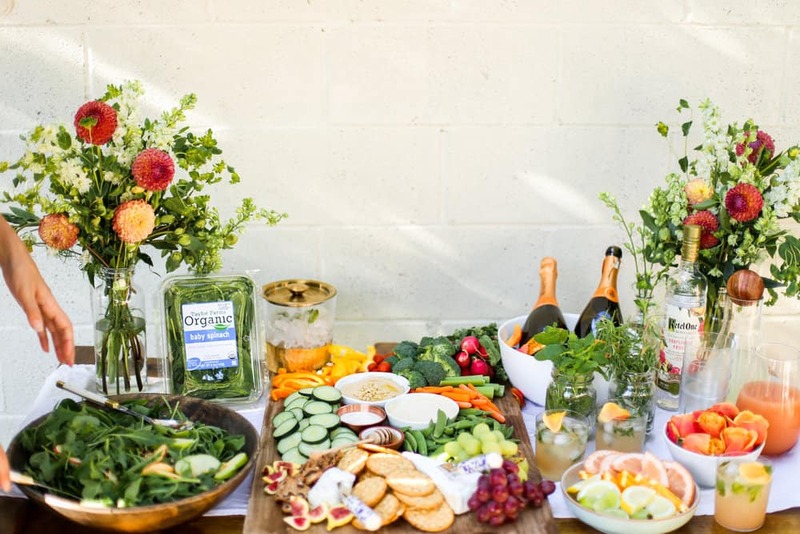 We planted the afternoon away and drank herbal flavor spritzers and snacked on fresh salads and crudités platters courtesy of my friends at Taylor Farms! Scroll down below to catch all the details! 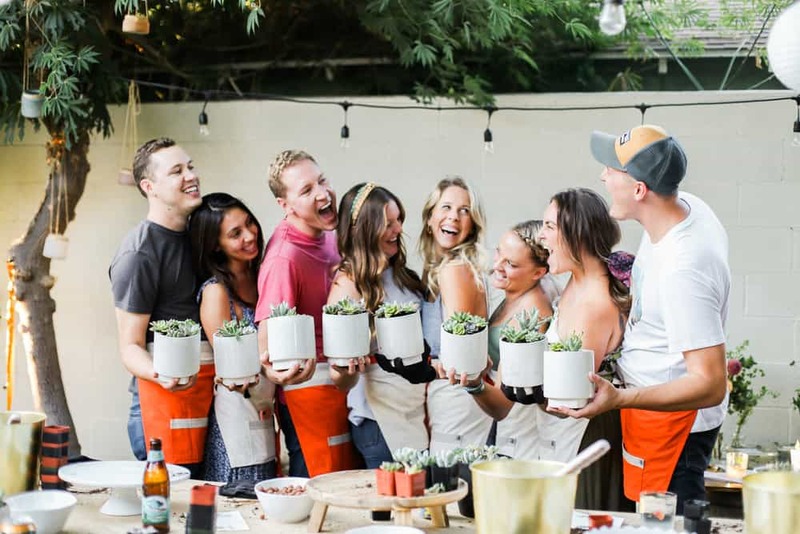 Last weekend we turned my backyard into a full on succulent planting workshop. It was def one of my favorite parties to date! I think any good party has some kind of purpose or fun activity. My friend Sierra came to me with the idea for our friend Jackie about a month before her birthday. I will 99.9% never say no to anyone that wants to throw a party at my house. We’ve already booked Abbie’s friends 30th birthday dinner for the end of the month! I think I have a party throwing addiction, but it’s under control I promise! 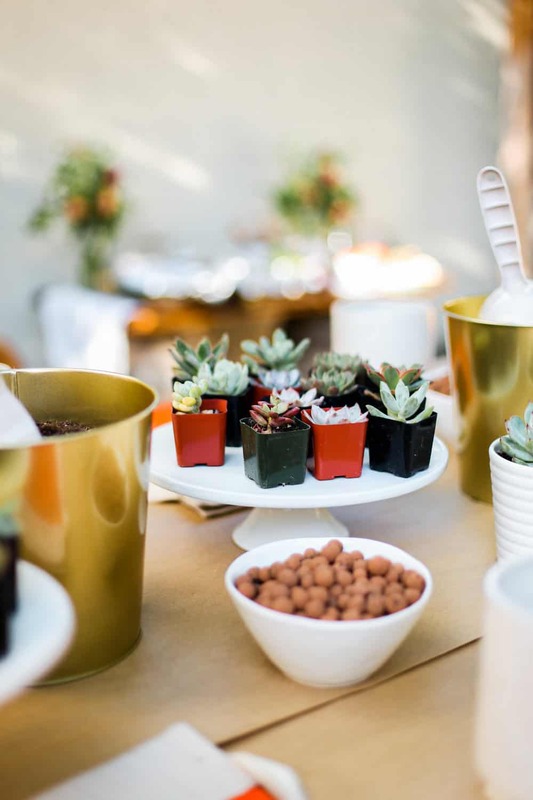 In Beverly Hills there is a gorgeously styled nursery and plant house called Rolling Greens. I’ve been to a few events there and it really is magical. 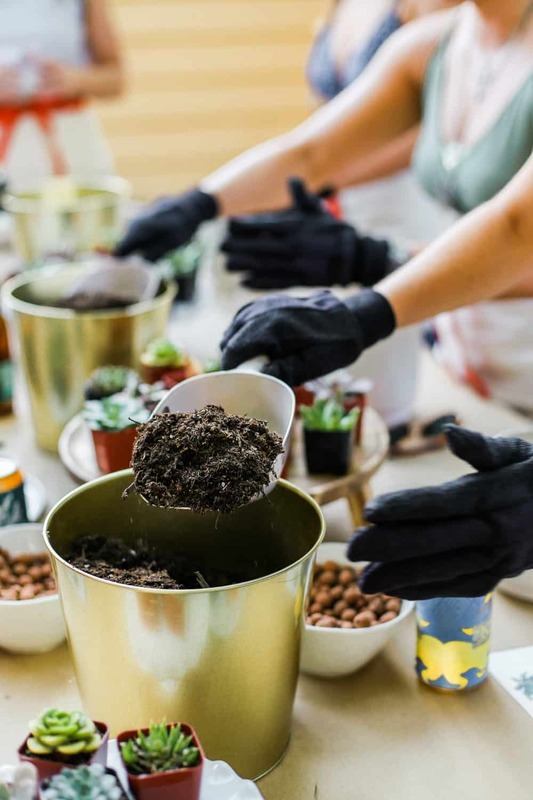 They have similar terrarium workshops, but you will pay quite a premium to throw your shindig there. When Sierra mentioned the party idea, I instantly thought it was pretty genius. This type of party doesn’t require a ton of work, nor will it take a dent out of your bank account! 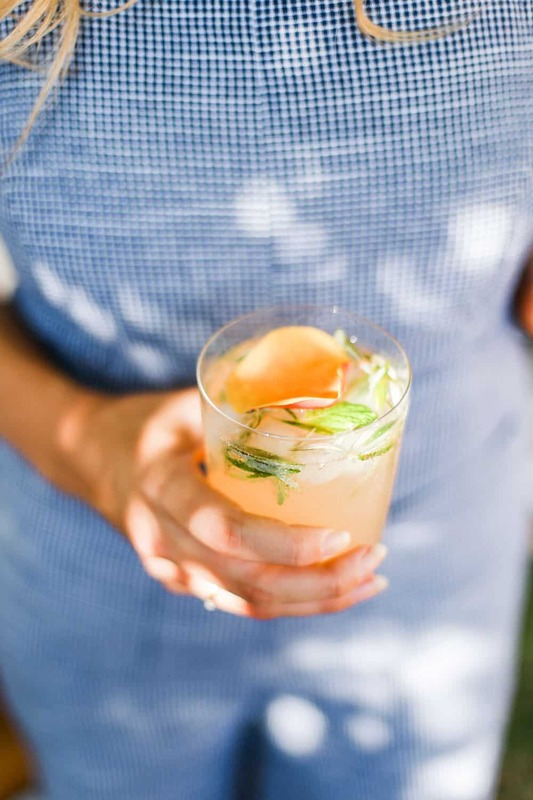 Follow along below for all of the party details, my favorite spritzer recipe and to see our boyfriends in their darling Hedley and Bennet Aprons. Did I mention I love getting people out of their element?! The theme was created around this ‘succulent planting’ concept. I wanted everyone to feel like my backyard was a little garden workshop. 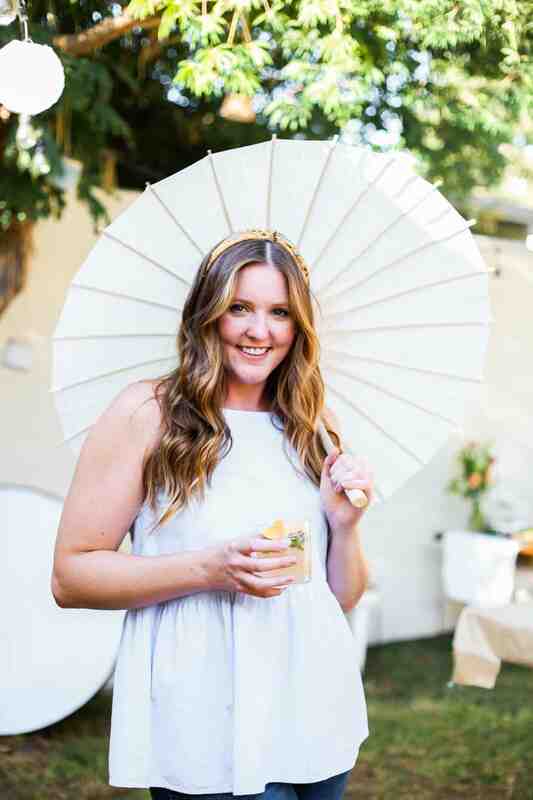 We filled the space with paper white parasols like traditional garden parties, turned my normal dining table into a standing plant station and mixed endless herbal themed spritzers and appetizers. 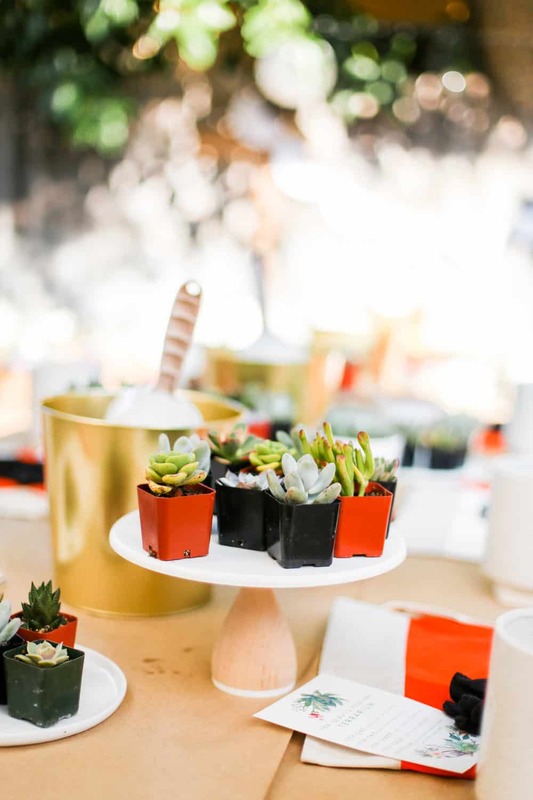 I kept the décor really simple with white triangle bunting and potted succulents around the food table and dining surfaces. 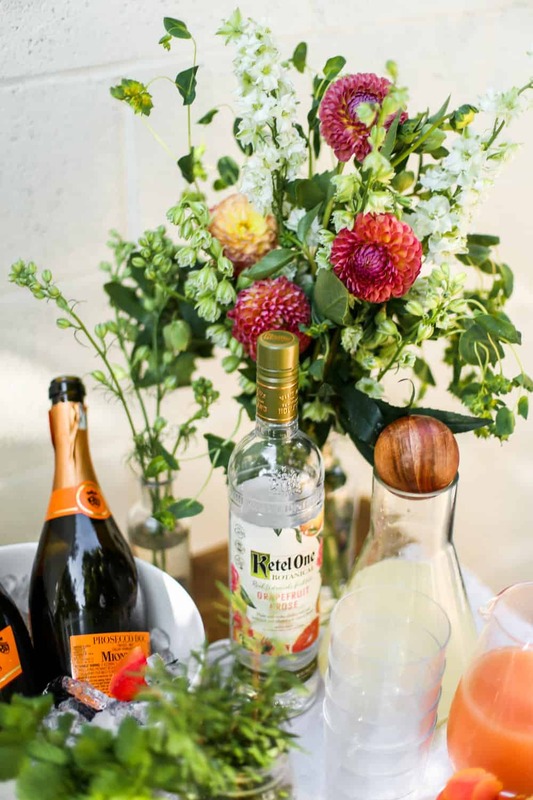 Every good party starts with a great cocktail. The cocktail station had a few different herbal elements. I froze all of the ice cubes for the cocktails with fresh herbs. I used sprigs of rosemary, basil and mint. The base of the cocktail was Kettle One’s herbal infused vodka. I took the short cut and bought a few bottles of these (they are actually so delicious!) but you can infuse your own. See this tutorial on infusing vodka! Lastly I finished off the drink with a splash of lemonade and filled the rest of the glass with prosecco. Delicious and refreshing! While throwing dinner parties is totally my forte, I knew I would have to keep the food a little big lighter and easier for this party. I put out a simple food station for people to nibble on as they pleased! 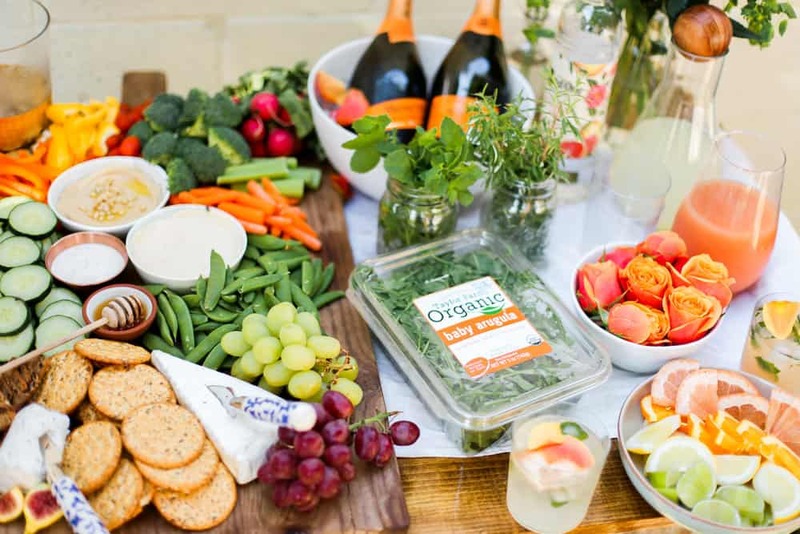 I made an extra large crudité and cheeseboard platter with Taylor Farms Organic Veggie Trays to use as the base of my snack board. Whenever I’m putting together food for a party I always try and take some shortcuts. 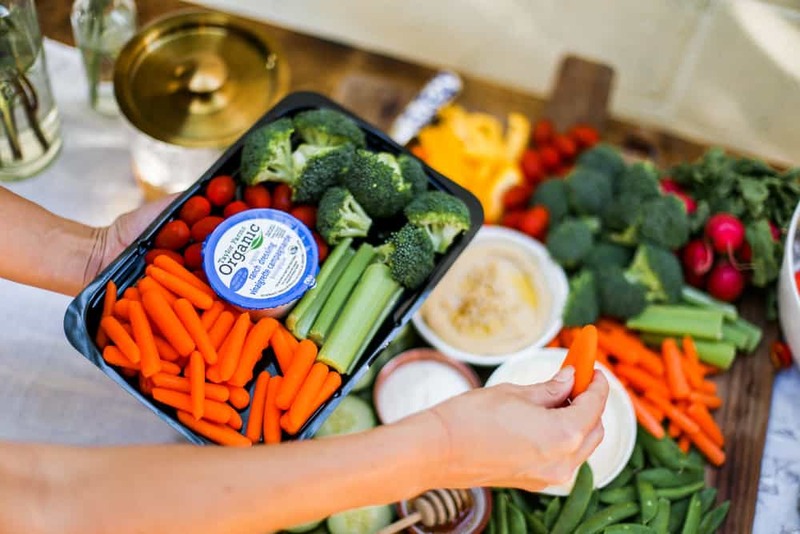 Taylor Farms Veggie trays are great because they come with precut celery, broccoli florets, carrot sticks and little cherry tomatoes. We also made a few fresh salads with seasonal ingredients and fresh greens. 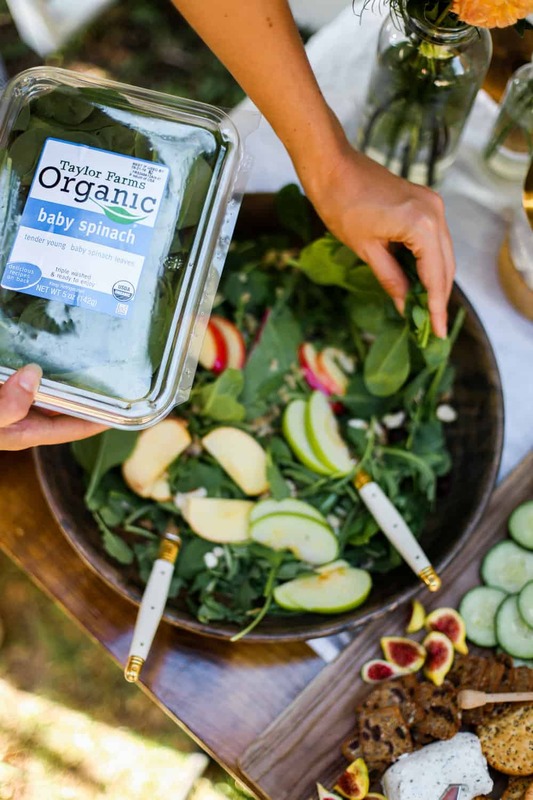 I always start a salad out with Taylor Farms organic baby spinach and organic baby argula. Fall is around the corner so I used a mixture of fresh apple slices, slivered almonds, blue cheese and balsamic dressing. 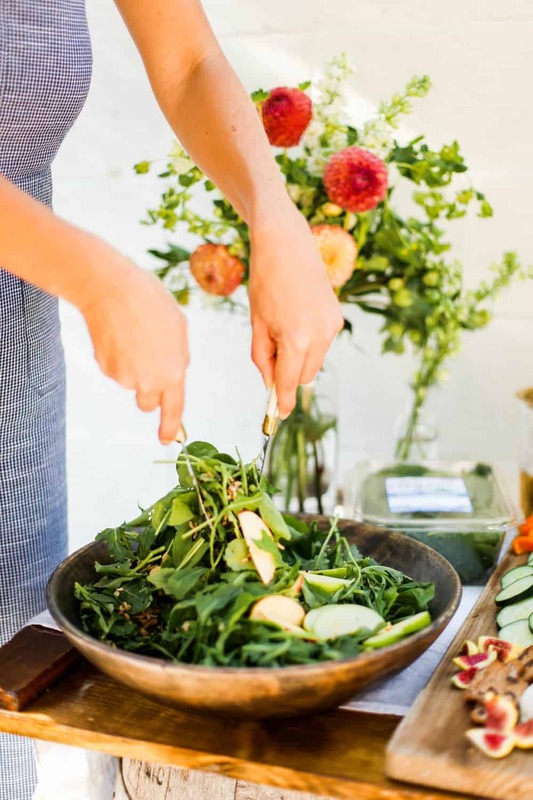 Even though summer is filled with fresh greens, fall salad flavors are actually my favorite! This was my favorite part of the party! I love making people feel special in little ways when they come over! 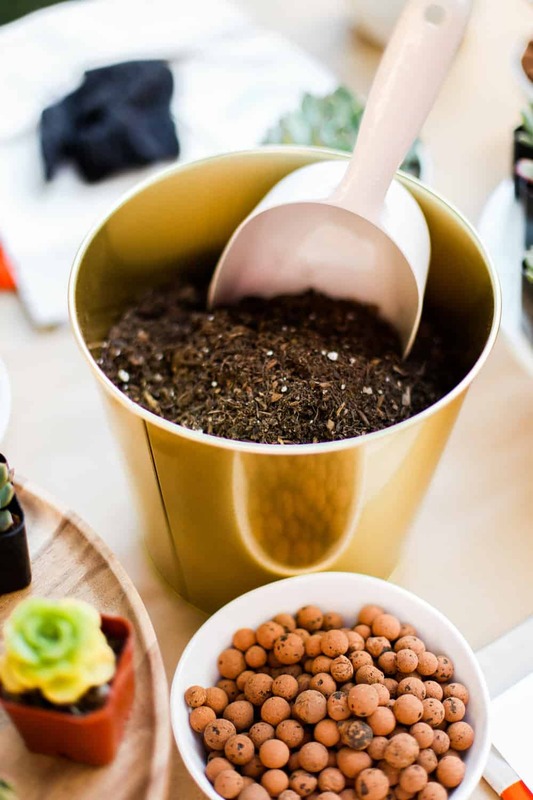 Each kit was equipped with a couple of fun items to keep everyone feeling like a planting pro. Each person got a super cool Hedley and Bennet Mini Bistro Apron. Whenever I have a Hedley and Bennet Apron I feel like I am ready to get down to business. 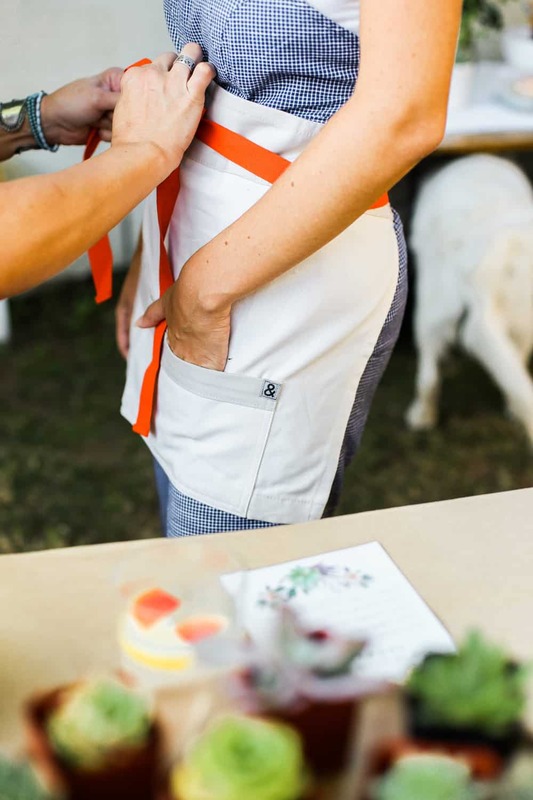 Each apron ties so properly and makes them fit like a glove. 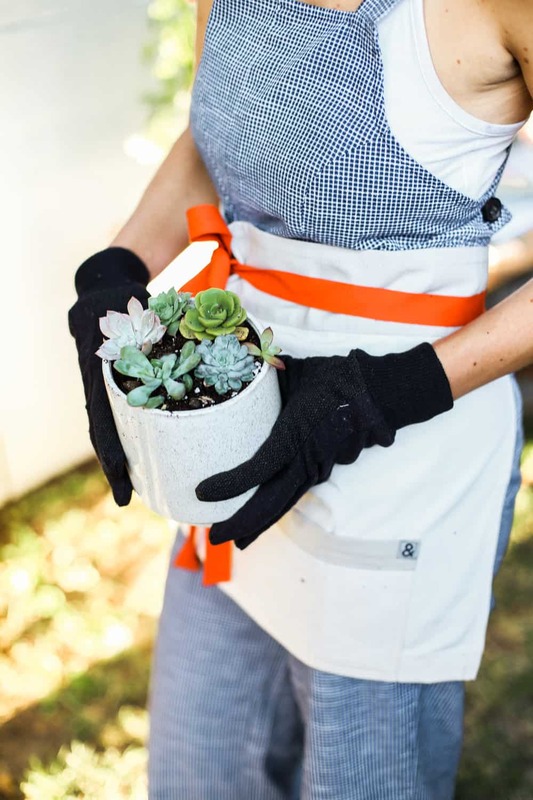 Along with our fun orange and tan mini bistro aprons we gave everyone a pot for their succulent, a planting guide card, and a pair of gardening gloves. 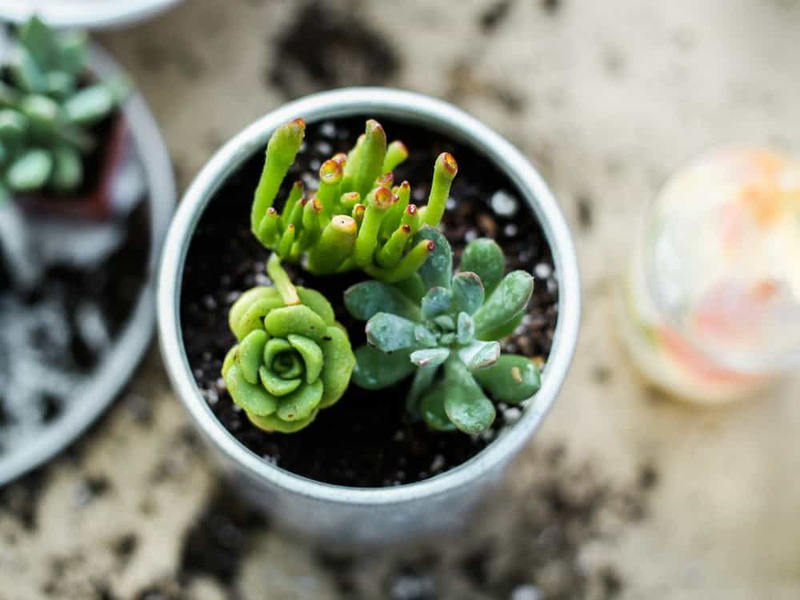 Last but not least you will need tons of mini succulents! 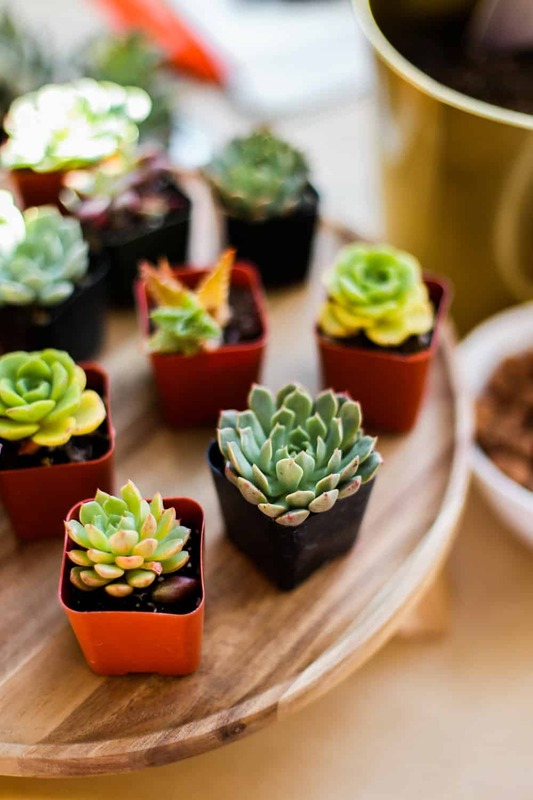 We bought a pallet of 64 mini succulents at the flower market. They were 85 cents apiece so it ended up being less than $60 for all of the plants and we even had some leftover! 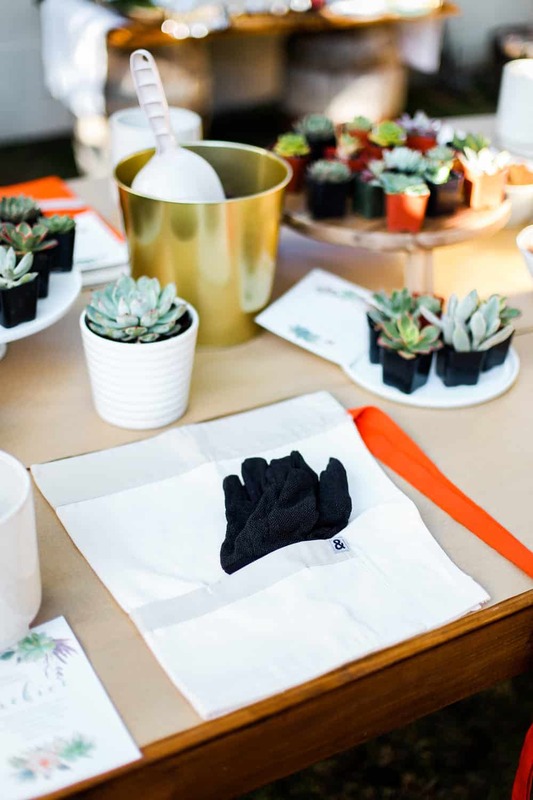 Catch the ‘get the look’ below to find all of the supplies that we used for the party! Previous Post 6 Dinner Party Tips and Tricks +Video!